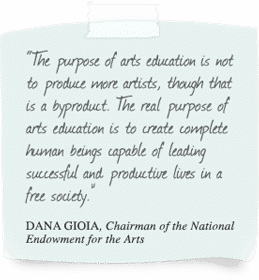 We believe that a robust fine arts education is important for all students. The goal of our arts program is to make students confident in themselves and their ability to express their ideas through artistic media. Our students are some of the most creative teenagers in Austin. We have the honor of developing their leadership as they prepare to enter the “creative class” and shape the cultural, economic, and aesthetic constructs of our world in the coming years. We work very hard to support our students who want to pursue the artistic life. From Foundations of Art to AP Studio Art, there is an intentional scope and sequence for the development of our students’ visual art skills. Students gain experience with a broad range of artistic media and are given ongoing support in the development of their personal portfolios. Performance artists in music and theatre grow through expert instruction and frequent opportunities for public performance – nothing substitutes for stage time in this arena. Our alumni are attending some of the top art colleges in the nation – The School of the Art Institute of Chicago, Cal Arts, Parson’s School of Design, School of Visual Arts, Savannah College of Art and Design, and the Art Center College of Design to name a few. Whether or not the arts will be central to a student’s future education and professional career, all our students gain depth in their personal character and sophistication in their perspective on the world through being surrounded by a creative, artistic environment, through the production of artwork, and through the experience of artistic expression. The arts help our students know that we value what they have to say. And being in a fun, creative environment is part of what makes our students look forward to coming to school in the morning.